Displaying less than 32,000 miles, this example has led a distinguished life. 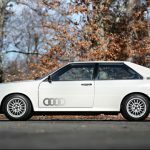 The current owner of 18 years, the former general manager and principle of an Audi dealership, is a devoted Ur-Quattro collector, having owned seven. He states that the car remains almost completely original, including paint and interior, and that it was Audi of America’s show car and display modle is the SCCA World Challenge series. 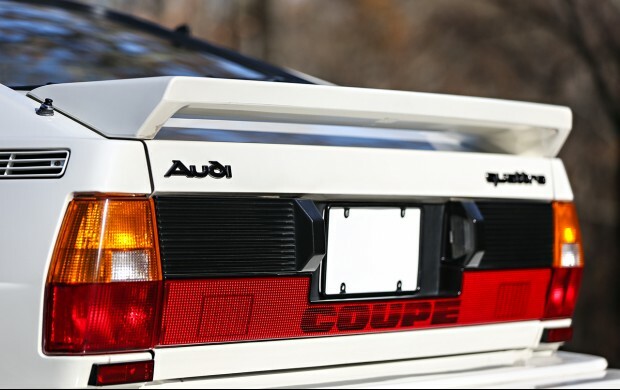 During the mid-1980s, Audi of America gave this Quattro to German motor sports legend Jo Hoppen, its race team’s manager, according to a letter in the file from Shokan Coachworks’ John Smith. 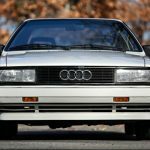 A Quattro enthusiast and Hoppen’s friend, Mr. Smith states that it was then owned by Steve Beiser, whose team prepared the SCCA World Challenge series Quattros. A letter from previous owner Gerald R. Bouchal, who purchased it from Mr. Beiser, said: “The car itself was the ‘show car’ which received all the trick pieces that the race cars had but was not used for competition purposes.” Mr. Bouchal noted the car included a balanced, blueprinted engine with performance camshaft and turbocharger. 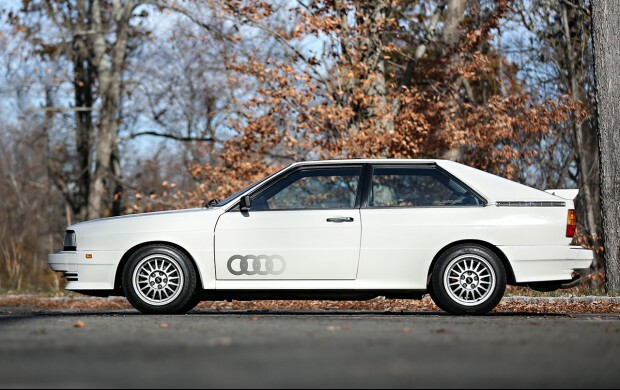 Meticulously preserved, this Quattro represents an unrepeatable opportunity to acquire one of the most original, and most significant, Ur-Quattros in existence. The listing does a good job explaining why this particular car is significant. 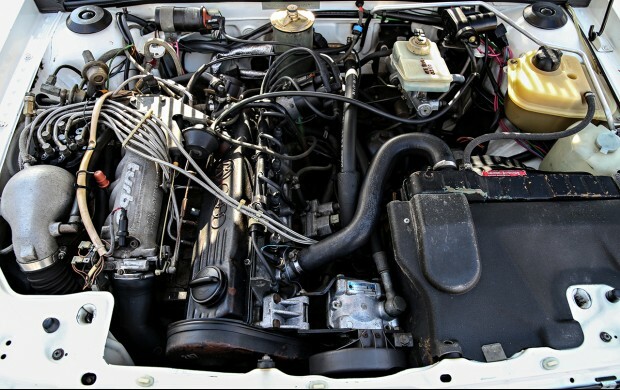 However all of the ’85s are significant, as they featured some upgrades to the model; they carried the same revised dashboard as the other Type 81/85 cars did in 1985, as well as the sloped grill associated with the bumper and light refresh. 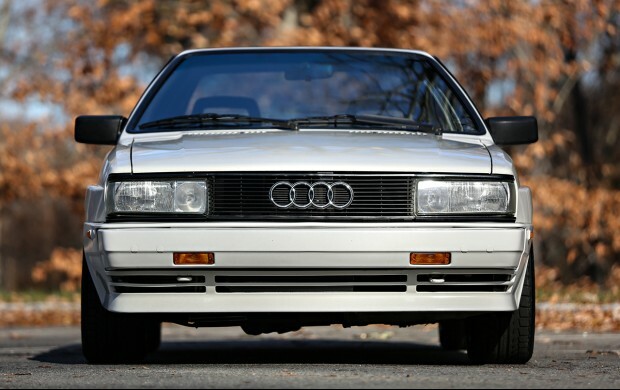 ’85 Quattros originally wore a unique sloped-quad headlight setup which is highly desirable because of its rarity, but honestly I think the H1/H4 Euros do look better personally. The trunklids were also painted body color (early models were matte black on the upper portion), and now had stick-on badges rather than the stickers early models ran. Other upgrades include the later fusebox, less prone to issue than the early car, and a few other odds and ends. While Gooding claims 75 were imported, Audi lists only 73 as the number. These really are about as rare as Audis get. Unlike most, this one is truly exceptional, too. The L90E Alpine White paint looks great, as does the interior. 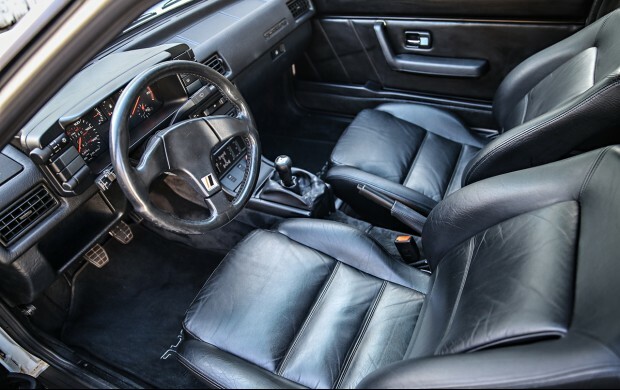 The original four-spoke wheel has been replaced by a Nardi wheel, but otherwise the rare all-black leather looks brand new. Outside of the Euro headlights and Scorpion stainless exhaust, the exterior also shows as completely untouched. Couple that with an interesting history associated with Hoppen and the SCCA World Challenge cars, along with AoA ownership, and this example really does have few peers. There really is little to complain about here, other than that if you’re a fan of the Quattro you likely can’t afford one of this stature. Where these cars could be had for a song just a few years ago, the top estimate at $90,000 probably sounds shocking to you. Yet compared to contemporaneous models it almost seems reasonable. Case in point? 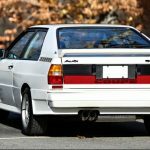 A 1989 BMW M3 sold via BaT this week at $102,000. 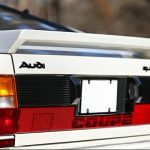 Doesn’t this Quattro deserve the same amount? 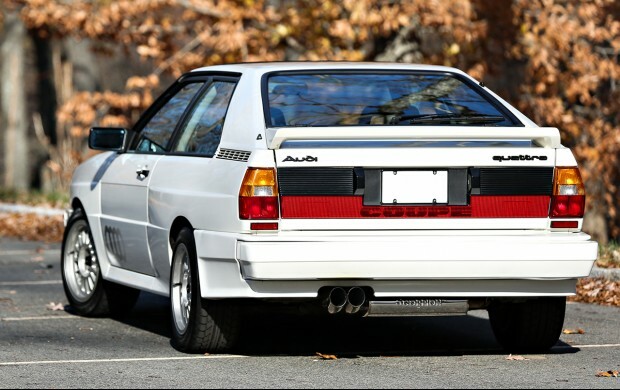 Tagged 1985, Alpine White, boxflares, Guigiaro, legend, MC1, Quattro, Ronal, Turbo, Turbocharged, Ur-Quattro, WRC. Yes. Yes it does deserve the same amount of money/notoriety as the E30 M3. It is the archetype of the modern performance world. I have noted, what I perceive to be, an over use of the word “iconic” lately. Your use in this case I view as accurate. Nice one Carter! I will be following this as the more this sells for, the more it makes my 85 worth. Chris – me too! Mine has 35k on it… This is absolutely beautiful and a nice story to go with it. However I’m not sure how this one can be described as “extremely original” yet have “all the trick pieces the race cars had”. Also the the AC control knob is not the same as in my completely and totally original car. And Carter you are correct, it was 73 cars. Now we have the whereabouts of 3 in this thread, wish there was a good registry to find the rest! Dan I have a birth records on my site.. I dont like the registry route as most people get all fussy about it.. This and the ’91 with similar miles that sold in the UK for $95k seem to set the new bar for urq’s. Guess I need to call Hagerty about my 11k mile ’83. I am very happy to see these cars valued so high given their importance, performance, and beauty. But damn. I was watching some UrQs on BAT 8 years ago and was thinking it was time to pull the trigger on some pristine UrQs that were going for $20K……but I never did. And now look at them. Way out of my price range for a garage queen car. @Christian; I’ll do you one better. 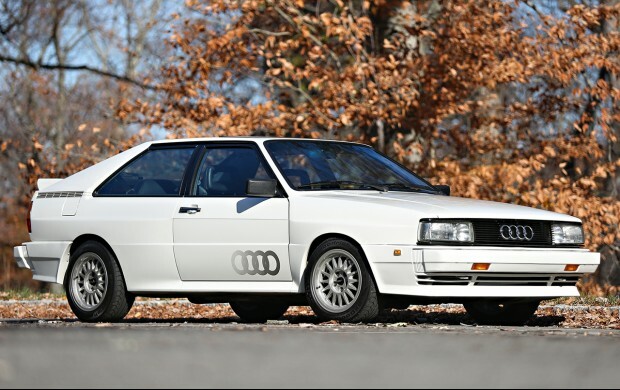 I was offered a Quattro – FOR FREE – and didn’t make it happen. It was a total wreck of a rally car, admittedly, but all I had to do was pick it up and I didn’t manage to. I still kick myself over that one. 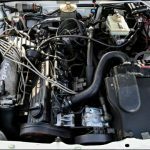 It would have been a huge project to get it running again, and I remember at the time thinking “I can just buy a complete one for $10,000….why would I do this one?” and that was probably a motivating factor in me not trying harder to get it. Good for a afternoon sigh.